Today, I'm sharing a pop up box card featuring the new Picnic With Friends and Picnic With Friends Creative Cuts. The illustrations are so sweet and adorable, it's impossible not to love this set. To begin, I stamped and colored the images from Picnic With Friends and the birds from Tea With Friends with Copics. I cut them out with the coordinating creative cuts. I stamped sentiment with black ink on white cardstock and cut them out and added trimmed blue card stock behind it. I made a box card that folds flat to 5 1/2 " x 4 1/4 and fits in an A2 envelope. I created the inserts for the box with Borderlines Trio Creative Cuts. I added die-cut grass to the front and the sides using the Grassy Trio Creative Cuts. I ink blended the clouds on the back panel with an acetate stencil I made using the cloud border from Landscape Trio Creative Cuts. I glued down the images to the box card as shown. Two of the flying birds are attached to a strip of thin acetate and then to the box. The sentiment was mounted with foam tape. That's it for today. Here's a quick video of me opening the card. Thanks so much for stopping by and I wish you a wonderful day! These cute little critters just melt my heart! Amy, your card is adorable. Thanks for sharing! Oh my goodness, this is absolute cute overload! 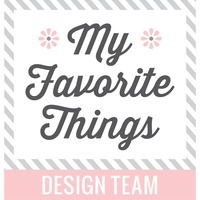 LOVE this so much, you're such a brilliant designer and card maker, Amy! Love the card! So clever! 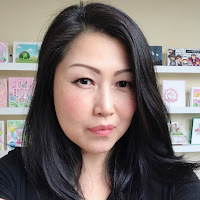 Love your adorable box card! Oh so fun! I love these two stamp sets, they are my fav from this release! Love those lil birds, they really do look like they are flying around the picnic scene you created! So cute! I love the card and how you used the two stamp sets together! Thanks for the inspiration. Wow, what a fun card! The recipient is going to love it! Love all your cards. This card is so bright and pretty! I think we should just call you queen of the pop ups! ;) TFS your adorable cards with us! This card is super cute. I know I would like to get one like it. OH my cuteness! 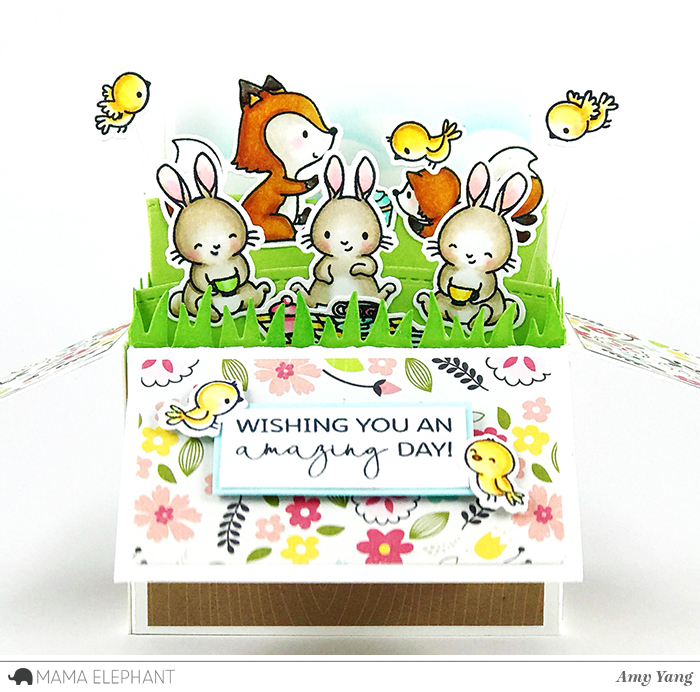 You are amazing, Amy...this pop up card is so cute and I just love your coloring! The little birds just get me! The one on top of the fox is so cute! I want to go on a picnic with those little critters! This is too cute! Love the cute scene with all the critters and flittering birdies! LOVE the paper used on the inside of the box flaps, too. Adorable pop up box - love all the little animals. Your pop up card is amazing!! Adorable critters!! So very sweet!! I love the little scene you created with this new release! Oh Amy! I always love your cards! How do you find the time to create amazing projects each time? What a cute scene. I love the surprise of a box card. I love this adorable pop up card! The birds flying around are so darn cute. WOW! Stunning work on this card! Love it and this bunny release is awesome. This is an amazing creation! The interactive pop up is such a fun way to send smiles in the mail :) Spring is definitely in the air!! I love the pop up card! It's amazing! Oh, how adorable! Lovely coloring! This pop up box card is so creative! I didn't realize that it folded flat and went in an envelope. You did a wonderful job creating the cute picnic scene! I love how the birds appear to be flying! This card is simply amazing....I love everything in it!!!! What a lot of work and creativity shown in this card box. You really pulled together an awesome scene. Great colouring and critter positioning. The birds look like they’ve taken to the sky. ( with the help of clear acetate). Such imagination! The bunnies are so adorable. The pop up box is one of my favourites! 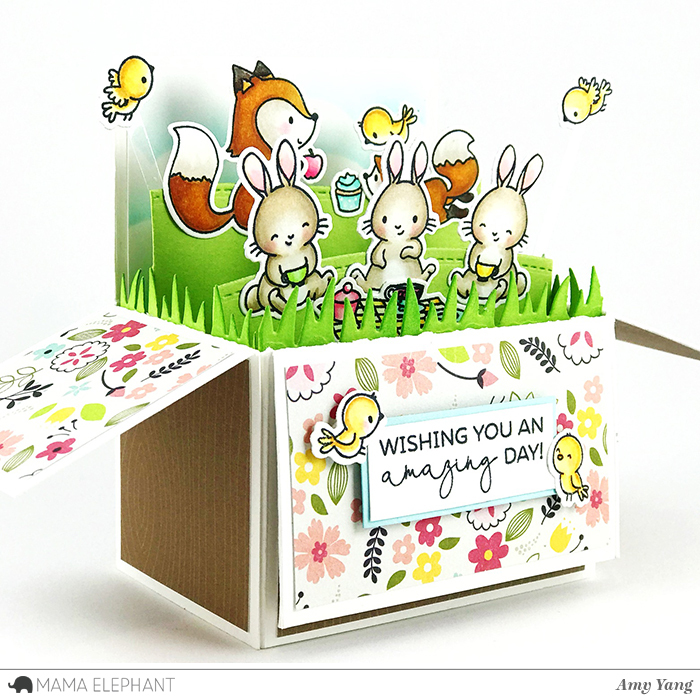 Love your spring box; great foxes, bunnies and birds! 1. Awww!!! Your project is totally cute!!! Love it!!! Wow, this is simply AWEmazing and so adorable. Anyone would L*O*V*E to receive this beauty! Wow! This is so cute! Cutest little bunnies! Adorable box card! I love all the sweet critters and your pretty coloring! Lots of delightful details on your card! This is box card is so adorable. Love all the cute critters. Thanks for sharing.. The card is adorable! You can feel the love that went into it. The scene is so cute! I love how all the layers work together, and the birdies flying on the acetate are the perfect final touch to make the scene more dynamic. Everyone looks like they are having SO much fun on your card! Wonderful! fun box scene and darling images. So cute. Adorable box card with these cute animals. Such a cute box card, Amy, and what fun to receive. The animals are adorable and reminds me of spring! This is so adorable!!! 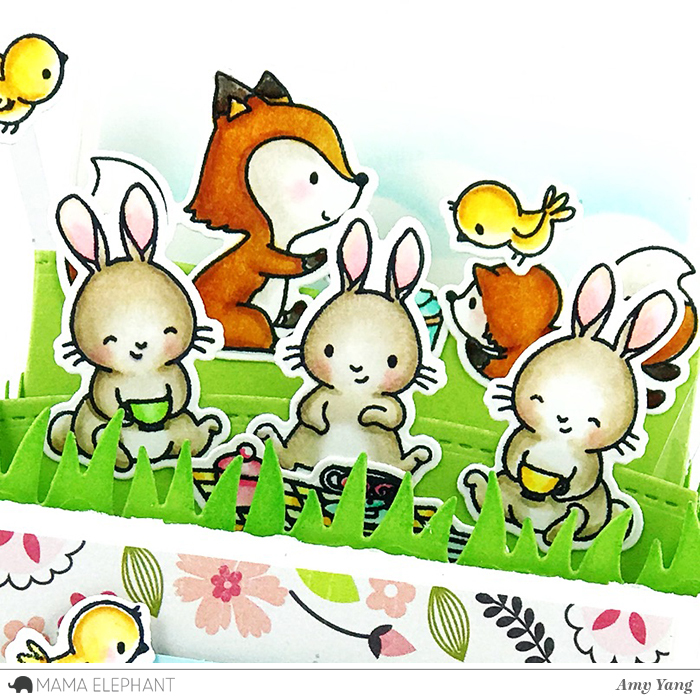 All these cute little critters in a fun box card! The scene you created is so sweet, too! Fab box card. Love all the little critters enjoying spring. very cute box card...love the variety of critters. So ADORABLE! I just love box cards! They are so fun! So much bang for your buck! Really worth the extra effort. Thank you for sharing! Super cute card!! I made my 1st "Box" card for my niece...I was so happy to find that they're not as hard as they look to make...Lol!! Love this cute and colourful box card, they are so much fun to make and to receive. Great new stamps as well. Love this! It is so cute and so fun. The recipient will feel so special when they receive it. Your box card is simply amazing! Cuteness wherever you look!! I love all the dimension and color! What a special card to give to someone special!! Oh, your box card is so cute. Love it. Thank you for the inspiration. New follower or stalker.. lol Love your blog. This is sooo cute! I thought I could do without this set, but thanks to your adorable box, now I'm not so sure! Wonderful job showing off this new set! What an amazing card! It is just so beautiful! This is the CUTEST thing! And two of my favorite things on top of that, bunnies & pop-ups. Beautiful box card! It's perfect and super adorable. Love it. This couldn't be sweeter!!! I love everything about this adorable card! WOW! Your project is amazing! That’s such a super sweet shadow box ! Absolutely adorable! Your attention to all the details and your coloring are wonderful. This really could not be any cuter! LOVE! Love that pop up box with that fence and those bunnies! Just way too cute! So adorable and fun! Darling! I can't wait to use this stamp set! !